On sunday evening I finally had some time to check it out. So CPU is a NexGen NX586-P90 at 84 MHz, no FPU. VESA Local Bus Board (at 42 MHz). - Updated BIOS for latest HyperCode and NexGen Utilities. Nice, never had a Nexgen system. Nice! any plans to resto the entire rig? Same board as mine. Looks like the owner of that one also had trouble finding those CR2302 batteries (at least, that didn't cost the moon) so they too used an external battery. Anyways, welcome to the club, we should all become elitists and not talk to anyone else. 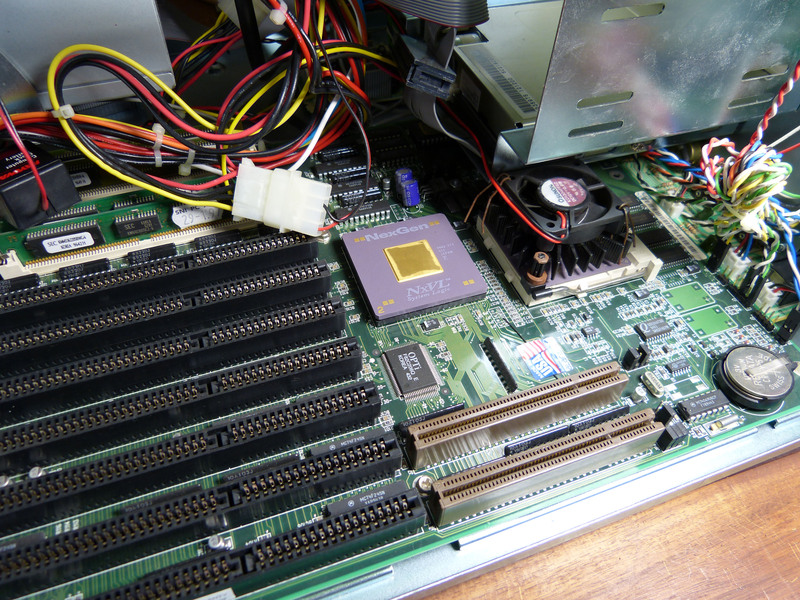 Looking at the heatsink, I swear I have seen that exact board somewhere before, I just don't know where it was. Either way, should prove to be fun for you, I haven't had a chance to do much with mine yet and probably won't until a case gets freed up, probably later this week. I really like the early Pentiums. 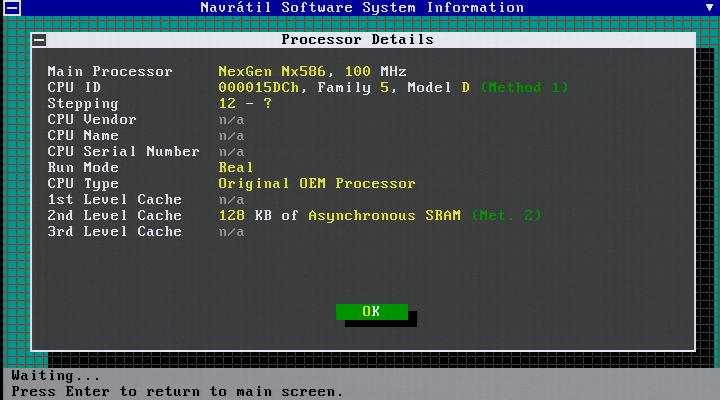 For real Dosgaming they are really good machines! 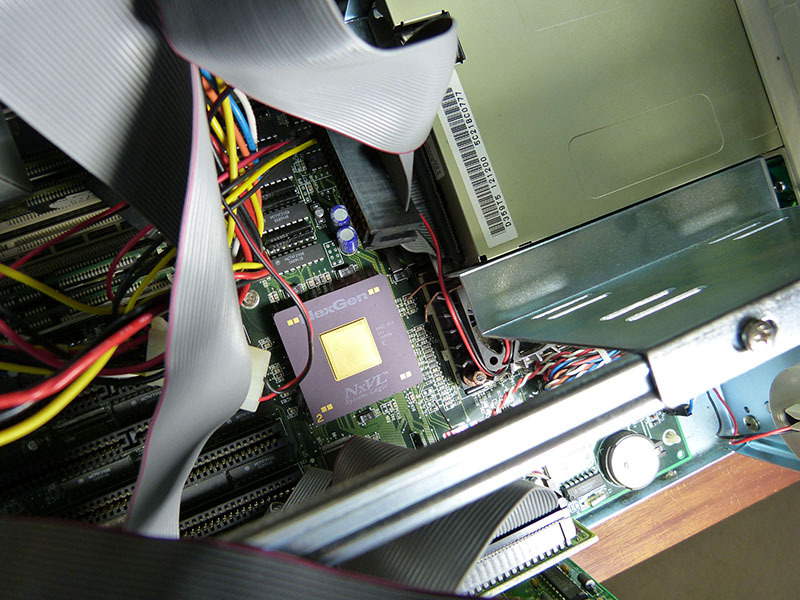 is a small and silent Desktop-Machine with a wide CPU-Range between P75-P200. dr.zeissler wrote: I really like the early Pentiums. This is something far cooler! 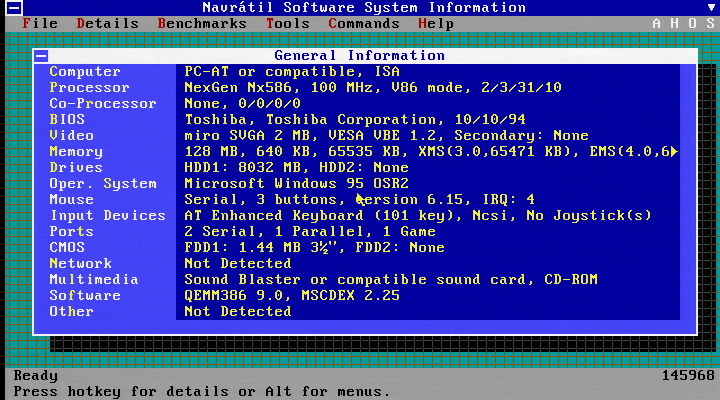 ...on the second view...jeah, not a "normal" pentium (586). ...but what's the deal? is it "only" rare or has it some really cool features? Did not knew this type of CPU before. 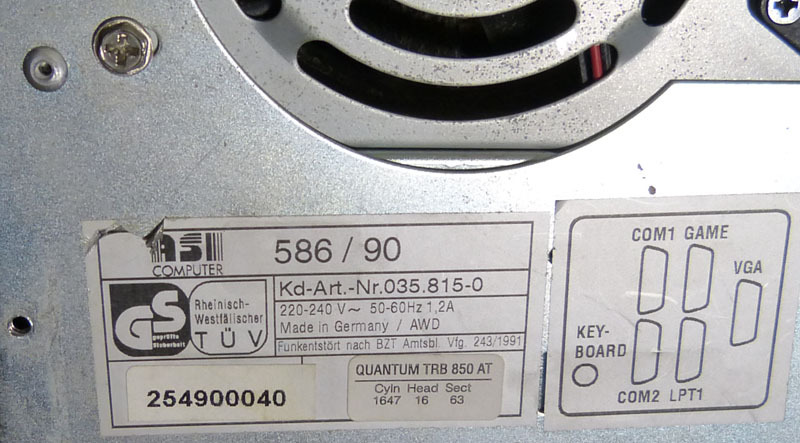 dr.zeissler wrote: ...on the second view...jeah, not a "normal" pentium (586). A Pentium is a Pentium. As in, the Intel chip. You shouldn't call anything else a Pentium. They have different architectures, and therefore different performance characteristics. dr.zeissler wrote: ...but what's the deal? is it "only" rare or has it some really cool features? Well, 'cool' features... AMD clearly thought so. They bought NexGen, and used the NexGen technology in their K6 chip. Scali wrote: Well, 'cool' features... AMD clearly thought so. They bought NexGen, and used the NexGen technology in their K6 chip. So, it's kind like a K5.5? Check out my blog and YouTube channel for thoughts, articles, system profiles, and tips. sgt76 wrote: Nice! any plans to resto the entire rig? Well, the case is standard AT form factor. It has small stereo speakers and about 10 knobs for volume, inputs for MIC and output on the back, most likely for Karaoke stuff. Nothing of this is connected to a sound card or CD-ROM. A few parts of the buttons for On/Off / Turbo / Reset are missing. I am not sure yet if it is worth to keep - it as nothing on it that is specifically 'NexGen'. I would rather like to put the board in another AT case that is more standard design and suited to put some case fans as well. K5.5 is misleading as the K5 is a AMD development with an AMD RISC core (29k). The NexGen was an independent development. The AMD K6 is based in the NexGen core. So there is no transition from K5 to K6, it is something different. 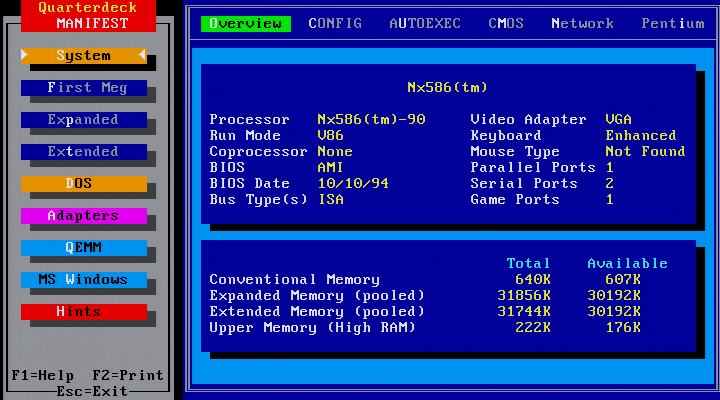 The interesting thing about the NexGen is that it has a RISC backend, and translates x86 instructions to native RISC-ops on-the-fly, very similar to what eg a Motorola 68060 or Pentium Pro do (and all x86 since then). I believe it was the first x86 CPU to do so. As far as I know, it did not yet have the capability to reorder instructions and rename registers internally though, like the Pentium Pro did. This was included in the Nx686, which became the K6. elianda wrote: Well, the case is standard AT form factor. It has small stereo speakers and about 10 knobs for volume, inputs for MIC and output on the back, most likely for Karaoke stuff. Nothing of this is connected to a sound card or CD-ROM. A few parts of the buttons for On/Off / Turbo / Reset are missing. I am not sure yet if it is worth to keep - it as nothing on it that is specifically 'NexGen'. Can you post a photo of the case please? I had one like these in the mid-90s. 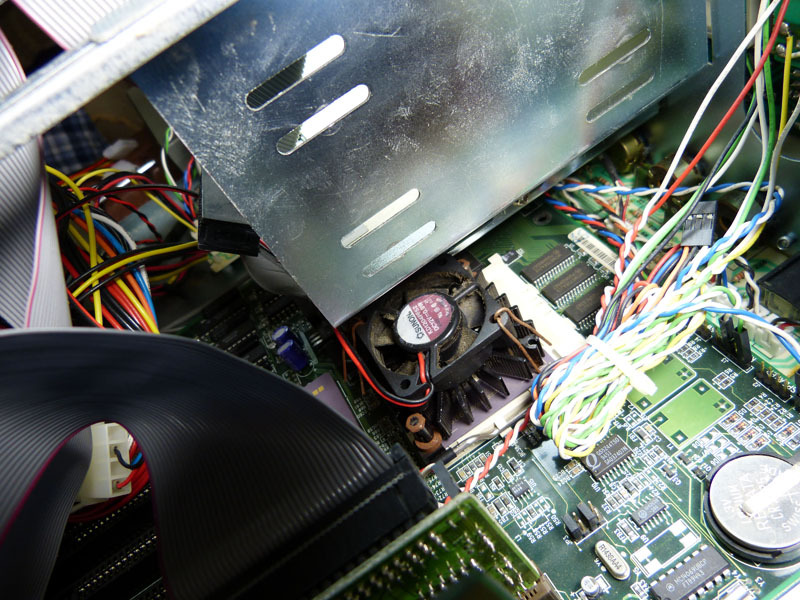 The speaker and mic connectors at the back are meant to be connected to a sound card via 3.5mm cables. If it's the same I had, I'd probably be interested in it. elianda wrote: K5.5 is misleading as the K5 is a AMD development with an AMD RISC core (29k). The NexGen was an independent development. The AMD K6 is based in the NexGen core. So there is no transition from K5 to K6, it is something different. Yep, this. Very cool find. I remember the NexGens being promoted in german computer magazines in 94 or 95. Too bad its not 586 Instruction combatible. Linux will only run with 386 Instruction Set on this CPU. 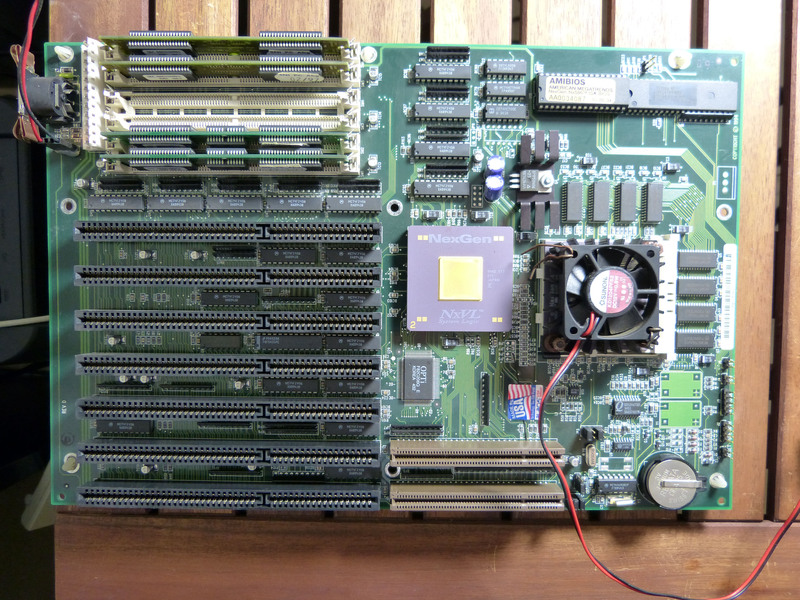 That's a really cool motherboard and CPU, always been fascinated by the NextGen stuff. Wish I'd bought one years ago when they were still at least slightly common. 386SX 33MHz,4MB Ram,ALi M1217 motherboard,OAK OTI077 1MB. Seagate ST1144A. 386DX 25MHz,IIT 387,8MB RAM,Opti,32K cache,WDC90C30 512K.Conner CF170A. 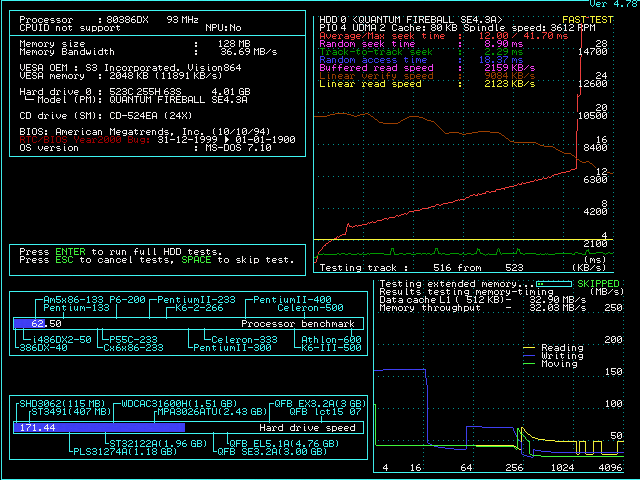 IDT Winchip C6 200MHz,DFi P5BTX/L,Number Nine S3 ViRGE 2MB,SoundBlasterCT2260,1.2Gb Fujitsu. matze79 wrote: No NPU Socket ? If it's a later model 5x86, the FPU may be integrated in the CPU. It has no FPU, but it is not really an issue. Quake does not run but performance would be unplayable anyway. Duke3D runs with IDON and DNRATE shows 14 fps at Start of HH / Let's Rock / No Sound. 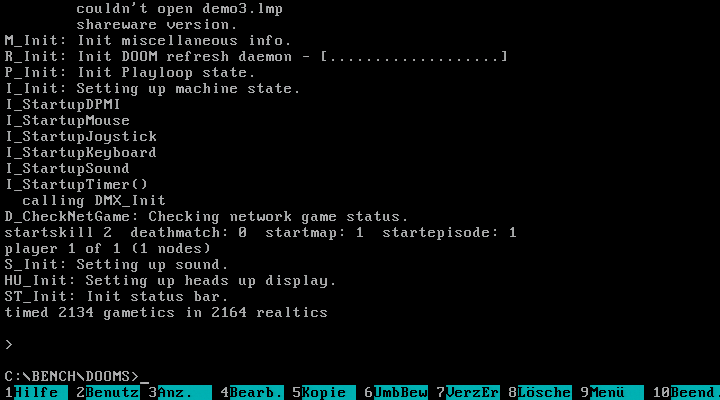 Performance in Duke3D is varying a lot, some locations have 70 fps, a few go down to 6 fps. 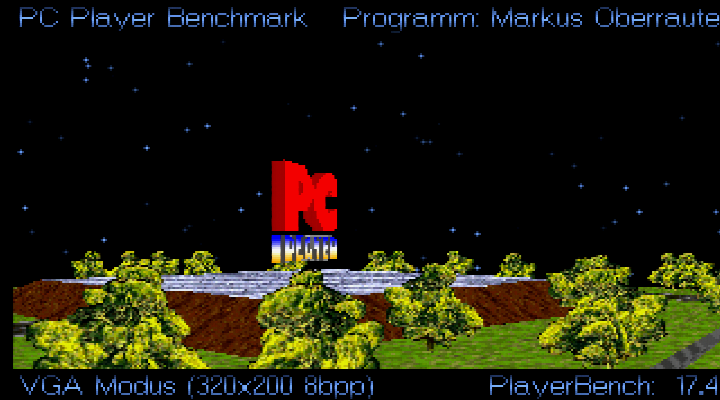 Same for the 386 build of Duke3D. Oh wow, that is a very unusual find. 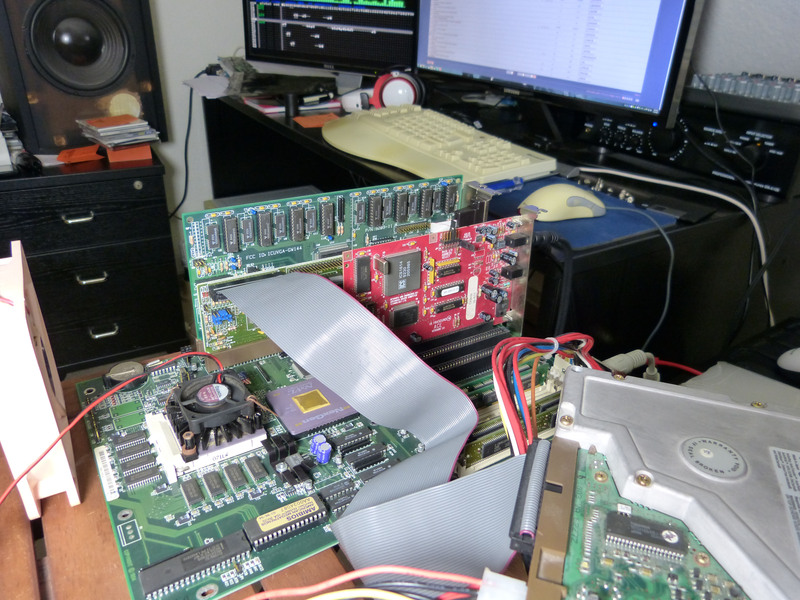 I seem to remember that it was possible to feed RISC instructions directly to the Nexgen and obtain a speedup, but there were so few chips it never really went anywhere. brassicGamer wrote: So, it's kind like a K5.5? Oh good, someone got my joke!